After meeting and determining the needs and desires of our client, the initial objective was to design a new logo and an updated, more current website to replace the obsolete site for the Emergency Dentist. They are a dental referral service that has a national reach. This was a challenging project, because although we designed a simple looking site, the reach is huge. One of the challenges we faced was building a website that did not have a menu option for each participating city where the emergency dentists refer. We were also challenged to build a single page design with a minimalist approach that that will be effective in speaking to the patient in need of a dentist. We determined we would design a single page site that will have a corresponding page for each city where they conduct business. We also built a solid Search Engine Optimization plan into the site design. We are pleased to report that this project is a vast success. 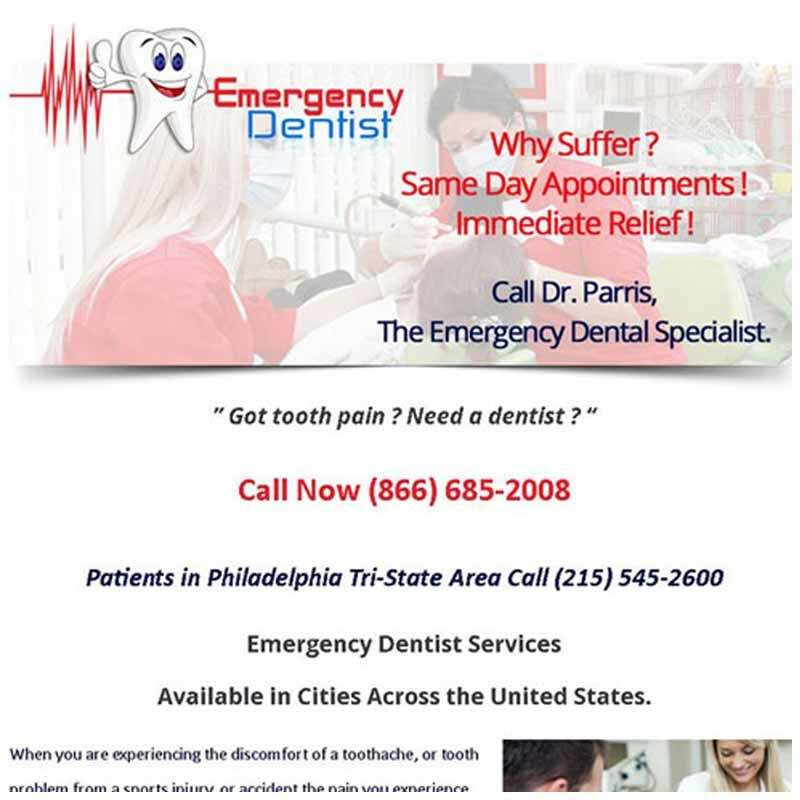 Due to the current design, The Emergency Dentist is currently searchable and reachable in 50 cities across the nation. Their visibility is expanding as are the number of cities where services will be offered. An additional 50 cities are being added to the Emergency Dentist Network over the first 6 months in 2014. To help ensure that they are triumphant we will be supplementing their current SEO strategy with GEO Coding that will allow for a city specific webpage to be searched in Google, Yahoo and Bing from a center point zip code specified with longitude and latitude. There will be a radius designation of 15 to 20 miles which means that anyone within that radius searching for an Emergency Dentist will see Dr. Parris’s Emergency Dentist Services in the search results.